Animated Widget allows you to create Group Contact Widget. Tap on Group Contact Widget opens list of pre-selected contacts. Tap on any contact launches default contact action, i.e. phone call. Default action is marked by so-called "overlay" icon - small icon of action at the right top corner of shortcut. 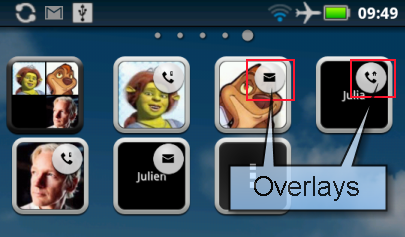 There are a couple of parameters in Applications Settings associated with overlays: "Enable overlays in group contacts" and "Hide overlays on shaking". 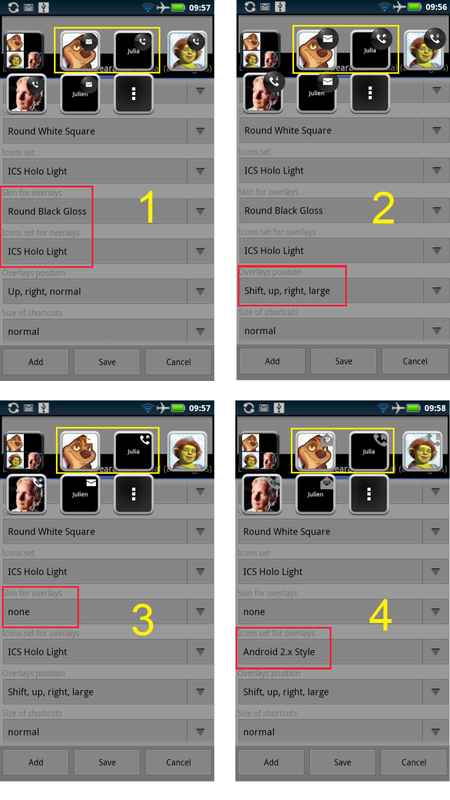 Fist one enables/disables showing overlays over shortcuts. Last one enables possibility to hide overlays for short time (~2 seconds) by shaking device. Animated Widget 1.6 introduces new possibilities to customize overlays appearance: it's possible to select skin for overlay background, iconset for overlay icon and overlay position. It's possible to hide overlay background at all by selecting "none" skin. 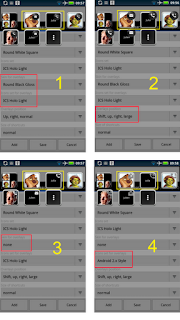 There are some examples of possible overlays appearance below. Please note, that Animated Widget 1.6 allows you to change widget parameters and immediately preview widget appearance without saving and closing Widget Properties.